I worked my half-day today, then came home and mowed. It's been too dry for the grass to be growing so I mowed seed heads off of the weeds. Whatever it was, it needed mowing. I still need to trim and weed, but since I'm getting over the tummy bug I decided to take it a bit easier today. I found this and had to show it to you. You were my very very favorite lawnmower, you know. You never went shirtless - when you had radiation in college, you were told to never expose your chest and back to sun. But you weren't the shirtless type anyway. You lived in jeans or khakis with solid polo shirts. It's hard to imagine you in anything else. You had suits and dress shirts and ties, and wore them when it was appropriate. But I always think of you in jeans and polo shirts. To me, that is you. So you mowed in your oldest jeans and your most ragged, stained polo shirts. That's why I couldn't throw out your old orange one. I remember when it got so bad that I consigned it to "yard work only" status. And I watched you work in it for so many years after that, that I couldn't bear to part with it. Orange was a departure for you, and the color was a spectacular failure - you look as bad in orange as I do. 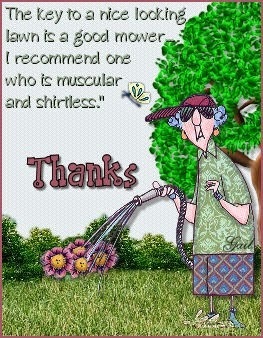 But now I love that shirt because I saw you do yard work in it for so many years. It's funny what ends up having meaning, isn't it? I wonder what in my closet you'd feel attached to. Come tonight, go through my closet, and tell me what is meaningful for you. I know some of my pajamas and nightgowns are favorites of yours, mostly the flannel ones. You always loved me in flannel nightgowns. If you visit tonight, I'll wear flannel for you even in July.